Sour cherry (also called tart cherry) is loaded with important nutrients, including phytochemicals (disease-fighting plant compounds), antioxidants and vitamin C. This tiny red fruit is beneficial for cancer prevention, reduces inflammation, enhances heart health and provides other health benefits. Sour cherry fruit is known since ancient times. It was one of the favorite fruits of the Persians, the Romans and the British. Later it was transferred to almost all parts of the world. Nutritionists for the sour cherry’s say that is wonderful fruit, contains everything that is needed for the body to remain healthy and vital. Sour Cherry has amazing healing properties. It is rich with many vitamins, mainly vitamin A, C, E and folic acid. From minerals it is rich with potassium and magnesium. Also contains solid quantity of iron, fiber and phenols. Fights Inflammation and Chronic Pain – Interesting thing at the sour cherry is that there are really strong and proven anti-inflammatory effects. Sour cherry is very effective when it comes to chronic inflammation. Also is effective with gout, inflammation of muscles, osteoarthritis and rheumatoid arthritis. Scientists have proven that consuming twenty cherries a day can relieve the body of pain with same effect just like one tablet of aspirin or ibuprofen. They conducted a research which strongly proved the positive effect of sour cherries on human health, namely, a group of volunteers consumed 250 grams of cherries every day for two weeks. At the end of the survey many examinations were made, which proved that at these subjects all the inflammatory processes were significantly reduced and the levels of cholesterol and triglycerides were normalized, proving that sour cherries are effective in the situation of hyperlipidemia. Reduces Oxidative Stress – Sour cherries are rich in antioxidants which are very powerful in protection of the nervous system and preventing from oxidative stress. It is especially important for the elderly because sour cherries significantly reduce the risk of neurodegenerative diseases. 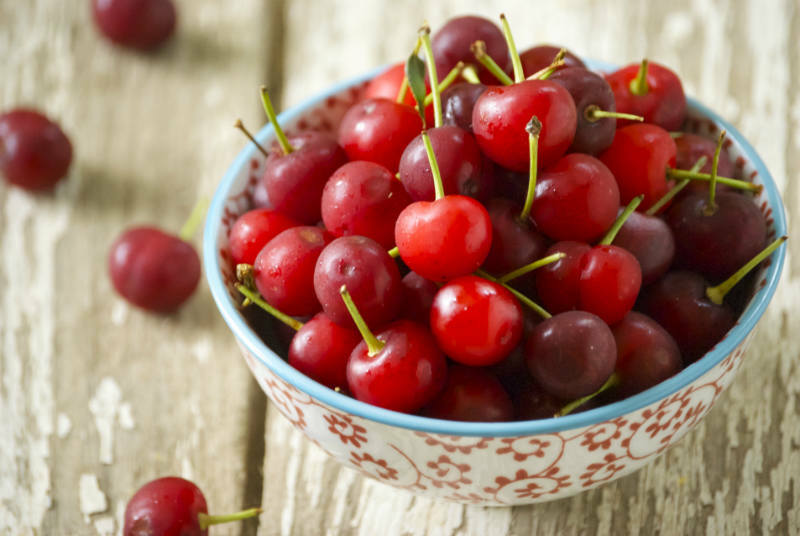 Protects the Heart – Sour cherries contain quercetin, one of the most powerful antioxidants. Among other functions, quercetin prevents oxidative damage, via free radicals, from damaging low-density lipoprotein (LDL or “bad” cholesterol). When LDL cholesterol is oxidized, it is more likely to adhere to artery walls, forming plaque, which contributes to heart attack and stroke. In a study published in the “American Journal of Physiology” in Sept 2006, sour cherry seed kernel extract (10 and 30 mg/kg) significantly improved the recovery of cardiac function (including blood flow and blood pressure) in rats after an induced heart attack. Protects from Infections & Boost Immunity – Apart from protecting against the damage of free radicals, the antioxidants (vitamin C, Carotenoids and flavonoids) also boost immunity and protect us from bacterial, viral and fungal infections, particularly those of the colon, urinary tract, intestines, and excretory system as well as coughs and colds. They are also very effective in giving protection against flu and other fevers. Regulates the Sleep – Sour cherry is one of the few fruits that contain melatonin, a natural hormone that regulates the sleep. The body normally secretes this hormone at night to facilitate sleeping. Because of this we can say that sour cherry is one of the few fruits that can help us to calm down and fall asleep. Melatonin is effective against symptoms caused by menopause, therefore, Sour cherry is an excellent choice for women entering menopause. Protects form Cancer – Carcinogens are harmful substances in water, air and food that can damage the body’s cells, which may result in cancer. Sour cherries contain antioxidant compounds called anthocyanins which possess anti carcinogenic capacity. These compounds are loaded with disease fighting chemicals such as perillyl alcohol, limonene and ellagic acid which can be beneficial in halting cell transformation that leads to cancer. Thus, sour cherry can be protective against cancers of the breast, lung, liver and skin. Improves the Brain Function – Flavonoids and carotenoids are very effective in improving the efficiency of the brain, improving memory and keeping it active, which are otherwise reduced due to the action of free radicals as a nearly unavoidable part of aging. Those who are afraid of having a dull brain and a low memory capacity in their old age, start eating sour cherries! You can remain quick and mentally clever even into your nineties. The antioxidant properties of these cherries also protect the nervous system from age-related disorders. Thus, they can be helpful in treating nervous disorders like Alzheimer’s disease, Parkinson’s disease, depression, disappointment, undue anxiety, and chronic stress.